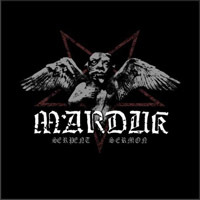 Swedish black metallers MARDUK will release their 12th studio album, "Serpent Sermon", via Blooddawn Productions/Century Media Records on May/June. Greek extreme death/black metal band DARK VISION announced the completion of their latest album "Ingrowth". The new album is scheduled for release in April 2012. In celebration of the band's 15 year anniversary of performing extreme metal, the album will be released on vinyl. Click here to watch "King of Emptiness", the new video from album. The members of sydney–based technical death metal band OUROBOROS are immensely excited to unveil the film clip for "Sanctuary", a song from their debut album Glorification of a Myth. The "Sanctuary" video was directed and edited by Paul Shedlowich of Plint Productions and was inspired by Colin Marks' Glorification of a Myth album artwork and the ancient Greek myth of Chronos devouring his children. Turkish death metal band BAHT have released a trailer for their upcoming album, " In My Veins". 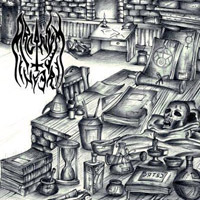 Italian black metal outfit ARCANUM INFERI's debut album "Ars Hermetica" -nine tracks of pure & raw black metal plenty of ancestral feelings raised from the depths of time- will be out on March 23 via Black Orgon Records. "Regain The Fire", the new video from Finnish melodic death metallers INSOMNIUM, can be seen below. The clip was produced by Obscure Entertainment from Tampere. It comes off the band's latest album, "One For Sorrow", which was released in October 2011 in North America via Century Media Records. NECROPHAGIA have released a teaser trailer for their upcoming DVD, "Gospel Of Gore". Crystal Eyes Records is announced the signing of one of the most promising bands in Death Metal "Gloom". Gloom is a Spanish band from Madrid who plays a dark death metal, dense and gets into the hands of Crystal Eyes Records for the release of his new EP "... Bless you all", that surely will not leave you indifferent. This work shows the power and aggression that the band has, as the musical evolution, scenic and staff, with darker sounds and a production that perfectly reflects the music. Gloom has a 2007 and a demo LP "Mater Tenebrarum" 2009, both self produced. For the artwork of this EP have had Juanjo Castellano, professional illustrator known for his work with Death and Black Metal bands in Spain and Europe. The cover of "Bless You All ..." accurately reflects the music, something aggressive and dark. The photographic work has been done by the professional photographer Xose Luis Frias. Recorded, mixed and mastered in DesmoSound Studies (except the drums and bass, recorded in VRS Studio and Coldstone Studio) in 2011. Midwest black metal behemoths STONEHAVEN are set to unearth their second full-length offering through Horror Pain Gore Death Productions on April 20, 2012. Entitled Concerning Old-Strife And Man Banes, the album was recorded and mixed at Massive Sound Studios in Kansas City by Corey White and mastered by Mike Nolte. The cover art -- a scene meant as a direct correlation to the mood of the record -- was crafted by the band's own Caleb May and depicts late 10th century King Olaf Trygvason of Norway and his men at the Godey Isles, torturing Raud the Strong. According to text, Raud was a priest of the local Scandinavian pagan religion, and had refused to convert to Christianity at the point of King Olaf's sword. Seizing him from his bed at night, they dragged him outside, where Raud refused conversion once more. The king decided he should die the worst of ways publicly to set an example. Thus, Raud was held down and after many attempts -- including the use of a drinking horn and hot poker -- he was forced to swallow a snake. The title in turn is meant to resemble the tongue-in-cheek chapter titles of many Icelandic Sagas. Two kennings are used, old-strife (representing historical woes) and man-banes (swords). Kennings are a type of old Scandinavian figure of speech found in Sagas and other writing. "We pride ourselves on our theme and style," commented the band in a collective statement. "Our album is the end product of years of hard work. It captures the horrors of old world Europe: atrocity, murder, and Norse Heathenism. From aggressive black metal riffs to magnificent Viking melodies, Concerning Old-Strife And Man-Banes encapsulates a journey into the terrifying past of our ancestors." Check out “Addressing A Scorn Pole” at the band's Official Facebook Page. Click here to watch "Dilated Disappointment", the new video from Charlotte, North Carolina-based metallers WRETCHED. The song, which is now available on iTunes and AmazonMP3, comes off the band's third full-length album, "Son Of Perdition", which is scheduled for a March 27 release via Victory Records. The CD was produced by Jamie King (BETWEEN THE BURIED AND ME, HE IS LEGEND, FOR TODAY) at The Basement Studio in Winston Salem, North Carolina. A two-minute trailer for "Crypts Of The Unrotten", the sophomore album from German death metallers DAWN OF DISEASE, can be seen below. Due on April 27 via NoiseArt Records, the CD was once again recorded at Soundlodge Studio in Rhauderfehn, Germany with producer Jörg Uken (GOD DETHRONED, DEW-SCENTED, SINISTER). "I Am Colossus", a brand new song from Swedish experimental extreme metallers MESHUGGAH, is available for streaming and free download at the Scion Audio Visual web site. The track comes off the band's new album, "Koloss", which will be released in Germany on March 23 and the rest of Europe on March 26 (March 27 in North America) as a CD digi, limited-edition Magic Cube (CD digi plus DVD exclusive to Nuclear Blast mail order) and two-LP brown vinyl via Nuclear Blast Records. German thrash metal veterans KREATOR revealed the cover artwork of the limited edition of the band's upcoming album, "Phantom Antichrist". The limited edition will be made available as two-disc digipack, including a bonus DVD. "Phantom Antichrist" will be released on June 1 in Europe and June 5 in North America via Nuclear Blast Records. The CD was recorded at Fascination Street Studios in Örebro, Sweden with renowned producer Jens Bogren (OPETH, KATATONIA, SOILWORK, DEVIN TOWNSEND, AMON AMARTH). The cover artwork for the standard edition of "Phantom Antichrist" was created by Wes Benscoter (SLAYER, DIO, BLACK SABBATH) and can be seen below. KREATOR will release a seven-inch single containing the "Phantom Antichrist" title track on April 20. The collector's item will be available in colored red vinyl (limited to 250 pieces) as well as in clear vinyl (limited to 250 pieces, exclusively available at the Nuclear Blast mailorder). KREATOR has selected Poland's Grupa 13 (BEHEMOTH, ELUVEITIE, SONATA ARCTICA, DECAPITATED) to helm the video for the title track of their forthcoming album, "Phantom Antichrist". Veteran female-fronted German thrashers HOLY MOSES will release the "30th Anniversary - In The Power Of Now" double album on April 30 in Germany, April 23 in the rest of Europe and early May in North America via SPV/Steamhammer. The CD contains re-recorded versions of 20 of the most important songs in HOLY MOSES' 30-year catalog along with two brand new tracks. 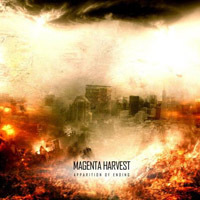 Finnish death metal band MAGENTA HARVEST will release its second demo, "Apparition Of Ending", on March 23.